A little neighborhood golf in a nice little Beverly Hills neighborhood that's absolutely perfect for beginners or for experienced players working on their short game. Oh yeah, and it's also great for bocce ball and for walking dogs--just look out for golf balls! Armand Hammer has his name all over Los Angeles, and it so happens he has his own "golf course" in Holmby Park. 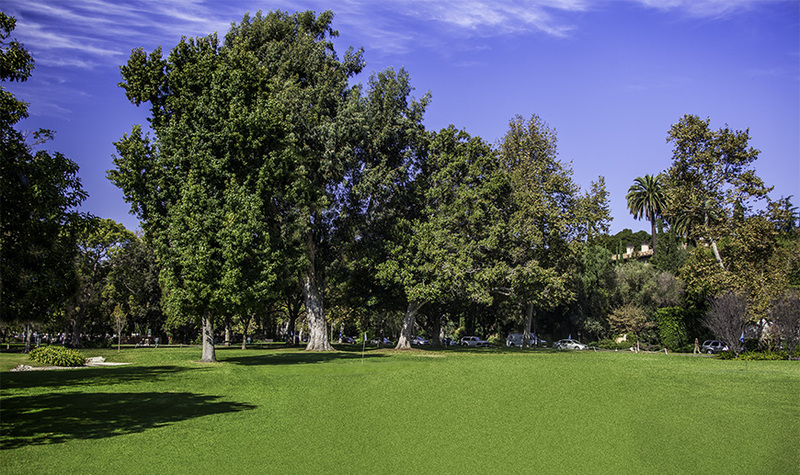 We really love this little hidden gem in a nice little Beverly Hills neighborhood in West LA -- the Armand Hammer Golf Course. It's a golf course by name, but it isn't one of those huge and colossal 18-hole courses or even the smaller 9-hole par 3 courses. It is actually 18 holes, but the holes are all very very small. We're saying probably 50 yards is the longest hole here. That said, it's a really cool concept. They're all fairly straight away and thus will take a pretty precise chip shot to land on the tiny greens here. Yes, there are greens, and yes, there are holes with a pin in them! The greens are not finely mowed, so when you putt it's really kind of like a thicker and slightly shaggy rug with some leaves across it. It IS thinner than the fairway grass, though, so we'll give 'em that. We should note that there is a tiny little booth that serves as the clubhouse, so to speak, and that they in theory do charge for you to play. They also, in theory, have clubs that you can rent. The thing is, the times we have been here, that clubhouse has never been open. So we've always just brought our own clubs and balls and been able to play around. Of course, if the booth IS open, you should pay, but if it isn't, then there are definitely a few folks who are playing. Basically, you don't have to go in the order of the holes here; just kinda camp at one or move around between a few once you get bored. It's best to bring a bunch of balls and practice a little, but you could definitely keep score if you wanted to. If you wanted to work on your putting specifically, you're in luck! There are putting greens here with a bunch of holes in 'em, and the grass is actually cut like a putting green! It's definitely a really good option to work on your lags or your gimmes, but keep in mind that the greens aren't stupendously large. Another thing is that people do like to walk their dogs here and just kinda take strolls around. Some people even like to have picnics here or little gatherings to just shoot the breeze. 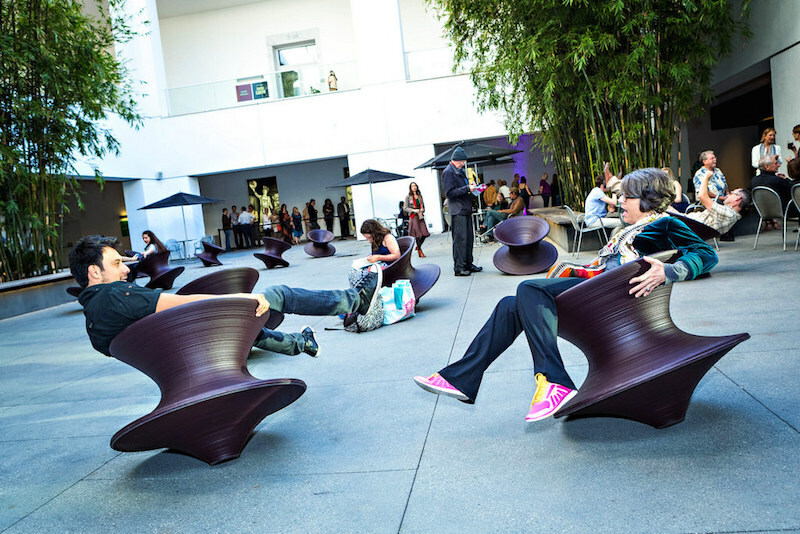 It's totally cool since this is a great place to do so, but keep that in mind before you shank a ball their way. I mean, technically, they should be aware that they ARE in a place that people are kind of playing golf in a sense, but still. No one wants to get hurt or pay for any hospital bills. Uh, I guess there was apparently that, too. Also, there is a little bocce ball court here that people play on, and we heard that every so often they have a free beginner's class! Bocce ball is super fun no matter what age you are, and it takes great precision and skill like golf does. Definitely a huge plus of this place. So there you have it! A little jewel of West LA, Armand Hammer Golf Course is seriously one of our favorite places to relax.